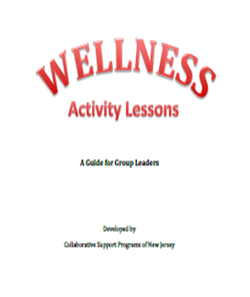 The Wellness Activities Workbook focuses on helping people with mental health conditions learn new behaviors and habits to improve their personal wellness. Each lesson has been constructed as a group activity that maximizes learning through building positive interpersonal relationships and actively involving participants. Each lesson can be used as a stand-alone group or combined into a multi-session series. When running a group as a series of lessons, the facilitator should begin each lesson with a brief review of the previous lesson and orientation to the lesson of the day. Each lesson should end with a summary of the day’s lesson and a preview of the next lesson. A sample lesson is provided to allow the facilitator to create new lessons on a related topic or activity. ​Lessons should influence the behavior of the participants outside of the group, not just provide a respite from his or her ordinary activities. With this is mind, discussions of practical applications and personal experiences are built into each lesson. Learning objectives for each lesson clearly identify the outcomes from each group session. ​The class is best offered in community-based settings. It can be taught in mental health or social service agencies, peer-run programs, community health clinics, or anywhere in the community where people can gather comfortably and privately. Wellness Groups are facilitated by a mental health peer. Lessons work best when attended by 10-12 people. While specialized training is not necessary to run these groups, experience with facilitating group activities and a general understanding of the concepts of wellness is beneficial. Also, it is important that the facilitator have good interpersonal skills to engage participants in the activities.